Kings lodge is spread in a sprawling estate of 12 acres in Rancha village (8-10 minutes from the park gate) and is surrounded by Sal forested hills on all sides. It has 4 cottage rooms and 8 stilt rooms with en-suite modern bathrooms. All cottage rooms have large open verandahs and each stilt unit has a wooden lofted balcony accessible from the inside of the unit for star gazing and even sleeping in the open. * 24 hours Power Backup in all rooms. * All rooms have A/C, large verandah with great views,writing table and chair. The rooms are well appointed with wood furniture in honey hues and inviting crisp cotton linen. * All bathrooms are with 24 hour Hot and Cold water, bath tubs and all modern facilities. 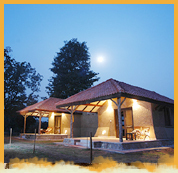 * Multi-cuisine dining hall with a fire place overlooking expanses of wild grasslands back dropped by Sal forested hills. * A well stocked nature library and a watch tower. * A massage deck created at an elevation of 50 feet above ground level to rejuvenate after jungle experience. * A Gol Ghar" (informal seating area) to enjoy the outdoor dining experience. * Swimming pool with eco friendly water filtration plant. * Eco friendly construction and eco sensitive waste disposal systems. The units are designed to blend with the surrounding landscape and with architectural style being rural vernacular. Above per night rates include Breakfast, lunch and Dinner & all applicable government taxes. These rates are not applicable between Diwali Vacation, New Year X-mas & Festival period.